While working on EndGame, I was fortunate enough to befriend a few individuals that are truly elite level poker players. Through conversations, email exchanges, and forum discussions we began working on a more personal profile. With the work of 4 people, 6 months time, and a mere 74 versions later, Retribution version 1.0 was born. It quite simply is, my personal profile. To answer the question of why I am sharing this, it is for two very basic reasons. The first is that I am somewhat limited by geographical restrictions and time to be able to completely maximize my profits with this profile. The second is that I will likely start working on a profile of a slightly different nature. This ensures that I will not be running into my own profile during testing and therefore am not concerned about it being on the tables. With that out of the way, on to what is the most important part. Retribution is designed as an aggressive short-handed profile. I have kept the full ring code from EndGame, which will make it play better in this format overall given the advancements to the post-flop code, but the work has all been towards 6-handed play. There is far more money and rake back to be earned on these tables. The profile plays a tight style, I cannot be too specific to protect the identities of investors, but it is certainly a TAG style overall. The profile never limps (except what remains of the full ring code) and the only randomness occurs within the bottom range of 3 and 4-bets. It has proven to win over all positions except the blinds, which is common for any decent poker player. 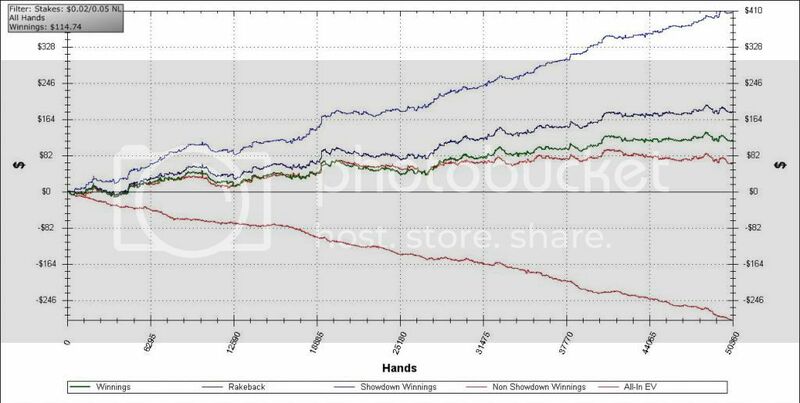 I have also included a graph which is taken from iPoker speed tables below. I have included the RB line at 57% to show the true earning potential beyond that of even what is earned on the tables. 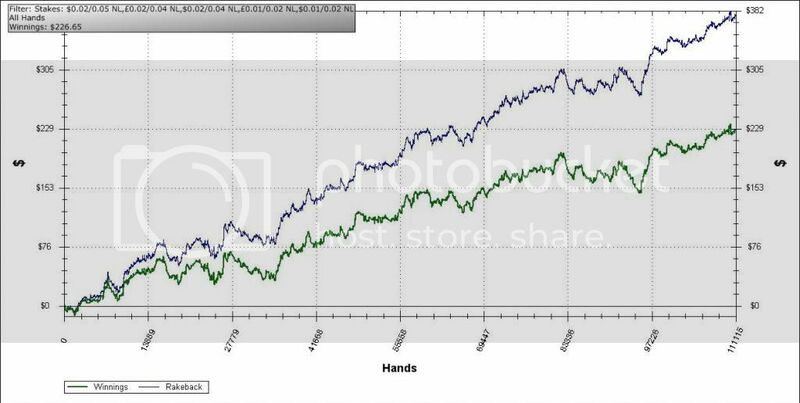 This graph only took a few days to create given the volume of hands on speed poker. Retribution will be offered in a text format. It is your profile and you should be free to do with it as you wish. All updates will be included in the price. The code itself is just over 9500 lines total and has been verified. This includes elements of Doodle to limit the amount of root level programming that is used during game-play. Doodle 95 is the version included, but even that has been modified during testing as well. $99 if you have not purchased EndGame from me. I will however include both EndGame and Revolution as a nice starter package overall. Please send all payments to Aenima773@gmail.com via PayPal. For those following the journal thread, anybody that purchase can get version 1.1 if they wish. It will officially become version 2.0 once released and tested, but it may be a few test runs prior to that. Version 1.0 will always be given out. I will also include the speed poker code line in 1.1 which I alluded to in the journal thread as well. It is currently 1.2, which I have sent to all thus far. I want to be clear though, 1.0 is the official version and 1.2 is what I am currently working with. I plan on 1.3 being sent sometime in the next week or 2, when time permits. Once I am confident and the profile has been sufficiently tested, then I will launch an official update as 2.0. Additionally, 1.2 adds a user variable specifically designed for speed poker. I encourage all to use this variable in this format, as it really is quite an effective tweak for those tables. 1.3 will be sent out later today. If you do not receive it and have purchased the profile, please let me know. I will explain the improvements via email with the profile. Congrats with the graph Sethunter! 6max speed or normal? 1st half of graph was speed. 2nd half includes lots of regular tables GBP £ as well as USD $, both NL2 and NL4. Where i can get rakeback 57% on wh? This profile is interesting, is there anyone use it in normal 6max NL 10 and higher ? The answer is yes, but I will not be sharing results at this time. lol, in fact i'm looking for a very good postflop profil. it's very hard to code all situations. I try to make a profil who can play in my place in the day in NL50. Seth, you say the postflop code Aenima is the best you have seen ? right ? What I said, which I stand by 100% is that the turn code is the best for sale code I have seen. I cannot say what it does differently or why I think that without disrespecting Aenima and/or customers. All postflop is a matter of preference in terms of how often to c-bet, check-raise, fold etc and bet sizing. Then it's about betting or call chasing draws etc or quitting on later streets. It's a logical well structured code and you will be able to change what you don't like. I am definitely here to support those that put faith in my coding ability. I can say that this code has had nothing but fantastic reviews thus far. I have been a member here a long time, and this code is quite literally the exact same thing that I use. 1.4 is the version out now, and there is not even one labeled as 1.5 yet. Not sure I can give it a better endorsement than that. To SethUnter: Thanks for always being willing to help others along. It sometimes seems like they want you to do everything but play the game for them, but you always are willing to offer advice along the way. I will not be around for the next few days, so do not be surprised if emails go unanswered. I will do my best, but it is unlikely I will have much time. I know it is primarily aimed at 6 max, which is what I want because of rb, but does it still hold its own in FR at ipoker. Sorry if this has been asked. I have not had it tested on full ring since Retribution was released. EndGame did quite well on full ring and the preflop is the same for both profiles. That portion of the preflop remains the same is always was, however it will of course rely on the improved post-flop of Retribution. So in theory, it should still perform quite well in full ring games. Sorry if this answer is not based on thousands of hands of testing, but I certainly invite the opinions of somebody that has tried it on full ring to respond.